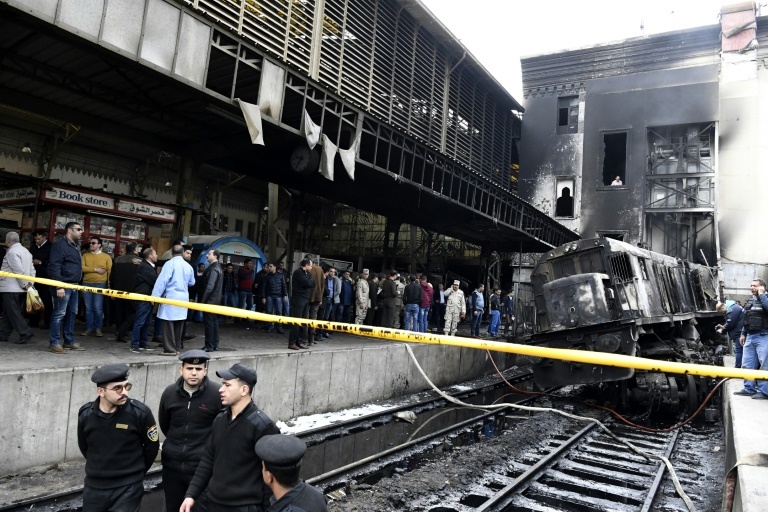 Egypt is once again mourning the victims of a rail crash. On Wednesday, a speeding train smashed into a concrete buffer at the end of Platform No. 6 at Ramses Station, the main railway station in Cairo. The engine’s fuel tank exploded on impact, according to the preliminary prosecution report. It has been reported that the driver left the controls to argue with someone about a train that was blocking the track, but failed to properly apply the brakes. The train then started moving toward the station with nobody at the controls. At least 21 people were killed and dozens more were critically injured, and the death toll is expected to rise. Images captured by surveillance cameras and commuters revealed the scale of the horror, as people at the station were engulfed in flames and survivors fled in panic, some of them in flames. The images, which went viral on traditional and social media, were horrendous. What is even more horrendous is that in Egypt we expect such disasters to happen every so often. We go into mourning for the victims and wait for the next tragedy. Meanwhile, the main causes of the problems are largely ignored. Egyptian National Railways (ENR) is the second-oldest national railway authority in the world, predated only by the former British Railways. The Ramses disaster again raises the issue of accountability for railway accidents in Egypt, their causes and how they might be reduced to bring them in line with statistics in other countries. It also raises the question of how best to manage such crises in the country. Transportation Minister Hisham Arafat resigned just a few hours after the Ramses crash without even waiting to learn the outcome of an investigation. Meanwhile, security forces arrested the train’s driver and it seems likely that he will be held accountable for what happened, which will again avoid addressing the wider issues and leave the main problems unsolved. The most recent official data, released in 2018, revealed a rise in the number of train accidents between January and September that year compared with the same period the previous year. However, they fell by 20 percent during the last three months of the year, from 538 in 2017 to 432 in 2018. In all, 56 people were killed and 98 injured in train accidents last year. In May alone there were 189 accidents, the highest number in a single month, in which three people were killed and five injured. The lowest monthly accident total was recorded in November, but even then there were 131 incidents and one person died and four were injured. ENR ranks only 78th in the world in terms of efficiency despite being one of the longest-established railway authorities in the world. This situation did not develop out of nowhere. Hardly a year goes by without major train accidents and casualties. In 1993, two trains collided north of Cairo, killing 12 people and injuring 60. Two years later, another collision claimed the lives of 75 passengers and injured hundreds. In 1997, 11 people died when two trains collided in northern Aswan due to a combination of human error and a malfunction of railroad signals. The Egyptian people live by chance and die by chance, and between one tragic incident and the next can be found familiar stories of neglect and failure. In 1998, a train crashed into a cement buffer near Alexandria, causing it to derail and plow into a crowded street market, killing 50 people and injuring more than 80. The following year, a train from Cairo to Alexandria collided with a truck and derailed, killing 10 people and injuring seven. In the horrendous El-Ayyat railway accident in 2002, a fire broke out on a train from Cairo to Luxor and spread to other carriages, killing at least 383 passengers and injuring hundreds. Four years later, a train to Mansoura collided with a train to Benha, killing more than 50 people and injuring 163. El-Ayyat was the site of another accident in 2009, when a collision caused the deaths of 30 people and injured 60. In 2012, a school bus was hit by a train on a level crossing near Manfalut in Asyut governorate, killing 50 pupils as well as the bus driver and a supervisor. In 2013, a train carrying 1,328 Central Security Forces conscripts to Upper Egypt collided with a cargo train in the Giza suburb of Badrashin, killing 18 soldiers and injuring 120 people. In 2015, a train to Suez hit a school bus on a level crossing near El-Shorouk city, killing three children and injuring 26. According to the most recent official data, in 2018 ENR generated revenues of more than 2.2 billion Egyptian pounds ($126.2 million), an increase of 253 million Egyptian pounds (13 percent) compared with 2017. Passenger numbers rose to 256.7 million, compared with 243.7 million the previous year, an increase of 5.3 percent. Despite these promising numbers, everything about Egypt’s railway system is in need of development, including its continued reliance on human input instead of the electronic systems that are employed in the rest of the world. Moreover, there is a need to renovate the signaling system; about 15 percent of the system is electrical but the remaining 85 percent uses an outdated mechanical system of a type no longer used anywhere else in the world. Railroad crossings are the main cause of train accidents in Egypt. In addition to the 1,337 legal crossings operated by ENR, there are many illegal crossings used by people near their homes without the knowledge of ENR or the local authorities. In the rest of the world, there are not as many crossings. To reduce accidents, it is necessary to update signals and barriers so that they operate electronically rather than mechanically or electrically. There is also a need to replace locomotives that have reached the end of their operational lives; implement better safety systems in stations; properly apply safety requirements to the maintenance of railway tracks; use pebbles between rails; weld the rails in ways and using materials that conform to proper specifications; provide spare parts and schedule maintenance in accordance with standard specifications; and reduce the gaps between the salaries of senior employees, technicians and drivers. Another major problem is the human element, which is the most potentially dangerous part of the system as humans are the drivers, switchers, managers and operators who together are responsible for the lives of millions of people. There is a need to improve and develop their skills and education in accordance with advanced scientific methods. Some experts estimate that the cost of updating the Egyptian railway system, replacing old trains and locomotives over 40 years old, and improving level crossings to be at least 60 billion Egyptian pounds. They also estimate that this work would take at least five years to complete. The problems in the rail sector are typical of the problems facing many sectors of Egyptian society, all of which require not only solutions but also a will for change, not simply the removal or resignation of the minister of transportation or some other official. If not for the selfless heroism of a number of citizens, the latest rail disaster would have been even worse. But for the bravery of the Egyptians who helped save the wounded from the fires, the number of victims would have been much larger. Had it not been for the scores of people who queued to donate blood at hospitals near the scene of the accident, many of those who survived the fire would have died due to a lack of blood transfusions. Unfortunately, the fate of many citizens is being left to chance. The Egyptian people live by chance and die by chance, and between one tragic incident and the next can be found familiar stories of neglect and failure.